Gerry Connolly is a Democratic member of the United States House of Representatives, representing the 11th district of Virginia. Gerry Connolly received a B.A. in Literature from Maryknoll College in Glen Ellyn, Illinois, and an M.A. in Public Administration from Harvard University in 1979. Gerry Connolly is serving his fourth term in the U.S. House of Representatives from Virginia’s 11th District, which includes Fairfax County, Prince William County, the towns of Dumfries and Herndon, and the City of Fairfax in Northern Virginia. Prior to his 2008 election to Congress, Connolly served 14 years on the Fairfax County Board of Supervisors, including five years as Chairman. Congressman Connolly serves on the House Committee on Oversight and Government Reform and the House Committee on Foreign Affairs. He has earned a reputation in Congress as a results-oriented legislator who does his homework and gets things done for his Northern Virginia district. Congressman Connolly is a senior member of the House Committee on Oversight and Government Reform, serving as the Ranking Member of the Subcommittee on Government Operations, and as a member of the Subcommittee on Information Technology. As the Ranking Democratic Member for the Committee’s largest Subcommittee, he is responsible for shaping government-wide policy for a broad range of issues, such as the federal workforce, federal procurement, regulatory reform, federal property, federal and presidential records, information policy, national drug policy, FOIA, the Paperwork Reduction Act, the United States Postal Service, the United States Census Bureau, and the District of Columbia. Through his background in foreign policy and his work on the Foreign Affairs Committee, Connolly has become a leading voice on foreign assistance reform, war powers, embassy security, and democracy promotion abroad. He also serves on the Subcommittee on the Middle East and North Africa and the Subcommittee and Asia and the Pacific. Congressman Connolly received a M.A. in Public Administration from Harvard University in 1979. He received a B.A. in Literature from Maryknoll College in Glen Ellyn, Illinois. After graduating from Harvard, Connolly spent 10 years on the staff of the U.S. Senate Foreign Relations Committee, where he handled numerous foreign policy issues including oversight of international economic issues and policies concerning the Middle East and the United Nations. Congressman Connolly also worked in the non-profit sector, primarily advocating for hunger aid and international assistance. He also has strong ties to the business community having spent two decades working for organizations and companies involved in international trade, regulatory matters, technology, and research. Connolly took part in anti-Vietnam War protests. Connolly received $2000 in lobbying funds from Planned Parenthood in 2008. In May 2013, Gerry Connolly was listed as an associate member the of the Congressional Asian Pacific American Caucus. In June 2013 Progressive Democrats of America assigned activists to deliver their material to almost every US Congressman and several Senators. Bob Sledzaus was assigned as contact for Rep. Connolly. Rep. Connolly is a member of the House Committee on Foreign Affairs, serving on the Middle East and South Asia and Terrorism, Nonproliferation, and Trade Subcommittees.. The Alliance for Retired Americans endorsed Gerry Connolly in 2012. The Alliance for Retired Americans Political Action Fund endorsed Gerry Connolly in 2014. Rep. Connolly is very close to the Islamic movement. Dar Al-Hijrah Islamic Center in Falls Church held its annual fundraising dinner on Saturday, April 3 2010, and Democratic National Committee Chairman Tim Kaine was on the guest list. So was Virginia Rep. Gerry Connolly, D-11th, Rep. James Moran, D-10th, Fairfax Board of Supervisors chairwoman Sharon Bulova, and Supervisor Penny Gross, D-Mason. Sen. Jim Webb, D-Va, and state Del. Kaye Kory, D-Falls Church, both had their names removed from the invitation after they were contacted by Frank Gaffney. But just days prior to the mosque fundraiser, Kaine and the other Democrats were still listed as honored guests. In the end, apparently, only Gerry Connolly showed up. Cogressional candidate Gerry Connolly received money from the Iranian American Political Action Committee during the 2018, 2016, 2014, 2012 election cycles. “American engagement with the Muslim world is important for all communities. As the Middle East goes through this period of transition, the United States and Muslim communities around the world have a responsibility to work together to shape a peaceful path forward. I thank you for your important work to this end…” - Rep. Gerald E. Connolly (D-Va.) (September 2014). Rep. Gerald E. Connolly (D-Va.) (October 2017). Congressman Gerry Connolly headlined a fundraiser sponsored by a Muslim Brotherhood supporter whose organization, Egyptian Americans for Democracy and Human Rights (EADHR), held an anti-Semitic rally in New York in February 2014. Now, U.S. Rep. Gerry Connolly, D-Va., attended a March 22 fundraiser to benefit his re-election campaign that is co-sponsored by EADHR co-founder Akram Elzend. The invitation also listed Mohamed Mohamed and Sameh Elhennawy as fundraiser hosts. Elzend said that he considers Connolly "a great man, a great congressman, who really abides our values, our American values, and principles, and he stands up for them." Suggested contributions ranged from $150 for guest contributors to $400 for a supporter and spouse. Elzend is an official with the Muslim American Society's Washington, D.C. area chapter. MAS was identified by prosecutors in a 2008 case as the "overt arm" of the Muslim Brotherhood in the United States. Virginia Attorney General Mark Herring July 2016 visited Dar Alnoor Islamic Community Center in Woodbridge. He wished our community Happy Eid, which is end of the Holy month of Ramadan. And he stated that as Virginia attorney general he will protect rights of all Virginians. We had Delegates Rich Anderson, Jackson Miller, State Senators George Barker, Jeremy McPike, [Prince William County Coles District Supervisor] Marty Nohe, Briana Sewell from congressman Gerry Connolly’s office, Anh Phan from Senator Mark Warner’s office, and [former Virginia State Senate candidate] Ed Gillespie were there. Gerry Connolly is very close to the Virginia branch of "progressive" Korean organization NAKASEC. Rep. Gerry Connolly did a press conference in August 2014 with delegate Mark Keam, Diane Bui and Grace Han Wolf. According to communications contacts Emily Kessel, Nicky Vogt, June 24, 2016;. 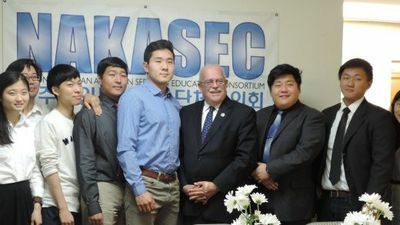 Annandale, VA— Following Thursday’s 4-4 decision in the Supreme Court United States v. Texas case, Representative Gerry Connolly joined National Korean American Service and Education Consortium (NAKASEC) to break bread with two Virginian immigrants Bati Tsogtsaikhan, Max Kim and and discuss the Deferred Action for Parents of Americans and Lawful Permanent Residents (DAPA) and the expansion of Deferred Action for Childhood Arrivals (DACA) programs and how their implementation would impact immigrant families in Virginia. While this split decision sets no Supreme Court precedent, these important, commonsense policies will unfortunately remain blocked nationwide. According to press officers Janine Walsh, Sharon Stanley-Rea, and Becky Belcore, August 30, 2017, faith leaders from multiple Washington-based organizations stood together to show their support and solidarity of young people who receive the protections of the Deferred Action for Childhood Arrivals (DACA) program. As the Trump administration considers stripping more than 800,000 young people of DACA protections by terminating the program, leaders of faith express their extreme disappointment. A coalition of faith-based organizations led by the Franciscan Action Network, Disciples of Christ, Church World Service, Sisters of Mercy, Leadership Conference of Women Religious and others announced today the start of 7 days of prayer and fasting from August 30 to September 5, imploring the Trump Administration to keep both DACA and TPS as they are. Patrick Carolan, executive director of FAN, opened the press conference and spoke about some of the responses from DACA beneficiaries at the 22-day vigil in front of the White House. Staff members from the offices of Rep. Jamie Raskin (MD-D-08) and Rep. Gerry Connolly (VA-11) read statements in support of DACA. Two of the speakers were young people directly impacted by DACA representing NAKASEC, the organization which coordinated the vigil. Sharon Stanley-Rea of the Disciples of Christ also spoke in support of DACA. President Trump’s decision to cancel DACA (Deferred Action for Childhood Arrivals) would have a devastating impact on Virginia’s economy. It would cost Virginia taxpayers more than $711.4 million annually in lost GDP, reports the Legal Aid Justice Center (LAJC), an immigrant rights organization with offices in Falls Church. The 800,000 Dreamers in the United States contribute $460.3 billion to the nation’s GDP and $24.6 billion to Social Security and Medicare, said Rep. Gerry Connolly, who represents Northern Virginia in Congress. Connolly announced plans to offer an amendment to the government funding bill that would prohibit the Department of Homeland Security from using sensitive information submitted through the DACA program for deportation proceedings. To apply for DACA status, immigrants had to submit personal information that now puts their whole family at risk. “It is cruel and un-American to ruin the lives of young people who stepped forward in good faith to participate in a program that has proven to be successful. They trusted the government,” said Dae Joong Yoon, co-director of the NAKASEC, an immigrant advocacy organization with offices in Annandale. In September 2017 a NAKASEC operative met with staff from Gerry Connolly's office to discuss the "importance of passing a "clean Dream Act." Congressional supporters by December 20 2018 included Gerry Connolly. By February 20 2019 endorsers of Alexandria Ocasio-Cortez's HR 109 (Green New Deal) included Gerry Connolly.